Quality leathe r lo o k , a t a f f o r d a b le p r ic e s ! Elegant and understated, hardwearing PU, featuring a nappa finish with embossed high-cut top. Elegant Bling hardwearing PU, featuring a patent finish high top with a diamanté accent and button. Modern and sporty, hardwearing PU with a full grain finish and reflective piping for extra safety in low light. 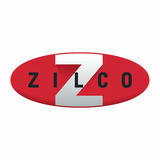 IF IT’S BRANDED ZILCO, IT’S BRANDED QUALITY. Jodz Elite Show Helmet An elegantly shaped show safety helmet. Deep, plush German velvet cover gives a luxurious finish. Soft, natural leather neck curtain for a more traditional look. Available in sizes 54cm - 61cm. Note: It is the Riderâ&#x20AC;&#x2122;s responsibility to ensure that the helmet they choose is approved for use by the organisation under which they are riding. P rices slashe d , Hu r r y , wh ile s t o c k s la s t .
Oscar Vibe Helmets The Oscar Vibe comes in 3 different metallic colours with sporty silver accents and vents. It incudes a removable mesh lining for increased airflow and ease of cleaning, with a sleek channel design for optimum airflow and cooling. Available in Medium (52-56cm) and large (57-61cm). Oscar MM Helmet The Oscar MM (Matt Metallic) is light on weight (only 430g), but definitely not on looks or features.The modern matt metallic single-piece shell features a sleek channel design for optimum airflow and cooling. Available in Small (48-52cm), Medium (52-56cm) and Large (57-61cm). Available in sizes 5’0” - 6’9”. The Supa-guard Detacha Combo features a cleverly designed detachable neck rug using concealed hook and loop fastenings, allowing to easily convert to a plain rug. GELATO range 5 Great colour c o mb in a t io n s ! Gelato Halters Super strong, double layer 25mm (1”) nylon webbing and stylish satin finish nickel plated fittings. Available in Cob, Pony and Full size. IF IT’S BRANDED ZILCO, IT’S BRANDED QUALITY. 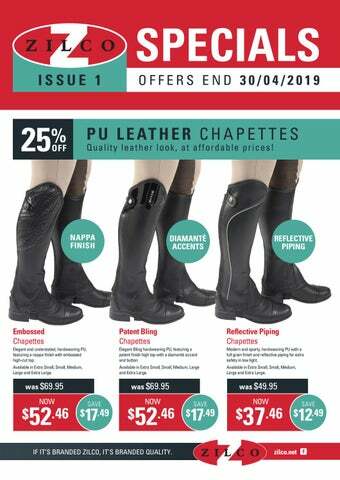 All RRP Prices quoted are Australian Recommended Retail only. The store is in no way obligated to sell at these prices. This offer is subject to change without notice. Freight and delivery charges are not included in this brochure and will incur an additional charge which will be quoted on placement of orders for any advertised product. All advertised products will be subject to availability.